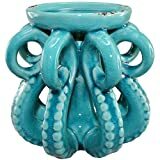 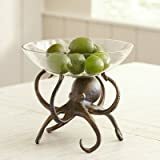 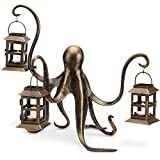 If you think every table needs an unusual conversation starting centerpiece, then look no further than this cool new Octopus Lantern. 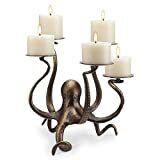 This whimsical eight armed octopus statue uses three of its arms to hold little tea light illuminated lanterns and the other five to keep itself balanced upright. 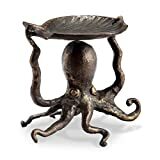 This decorative cephalopod is crafted from aluminum with a hand-painted bronze finish, can be displayed indoors or outdoors, and has hinged doors on the lanterns for easy access candle access.